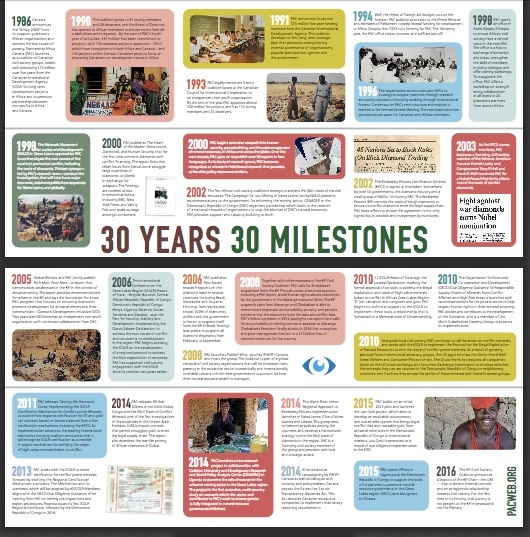 Canadian Network on Humanitarian History » Who We Are. A multidisciplinary group of – mainly – Canadian people, interested in the History of humanitarian aid, in academia, archives and NGOs. 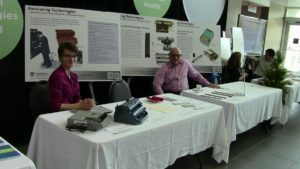 In May 2017, the CNHH became an affiliated committee to the Canadian Historical Association. 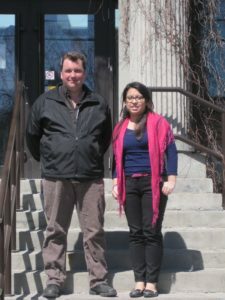 This site is maintained by Dominique Marshall (Chair, Department of History, Carleton University) and Sean Eedy (webmaster). Jill Campbell Miller (St. Mary’s) is responsible for the Network’s social media presence. 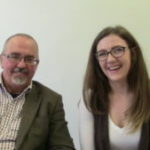 The wish to formalize an existing network of collegial exchanges and collaborations came after the workshop to welcome Kevin O’Sullivan from Ireland early in July 2014. Sarah Glassford and Nassisse Solomon (Western) are also associated with the creation of this network. 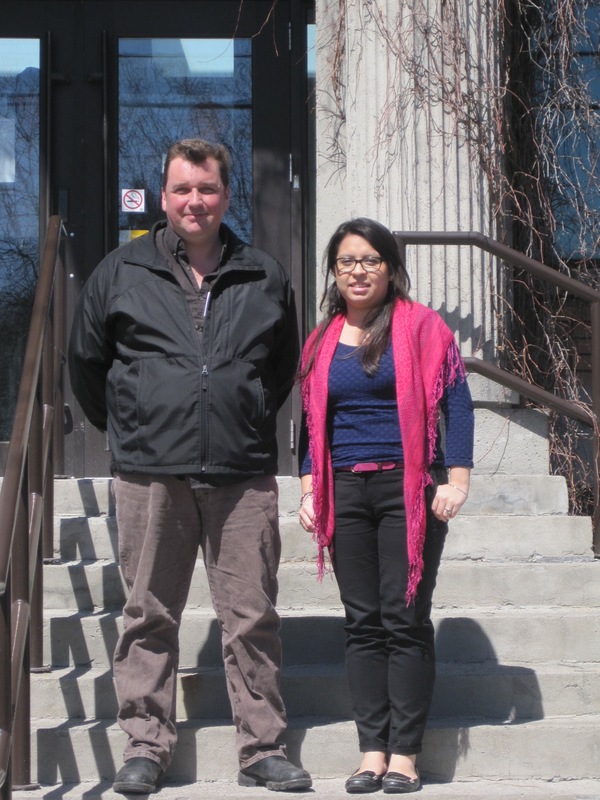 CNHH Member Will Tait and RA Erika Munoz on the steps of Oxfam Canada’s head office, 2013. Erika Munoz, Carleton University, I-CUREUS Project (Winter 2013). 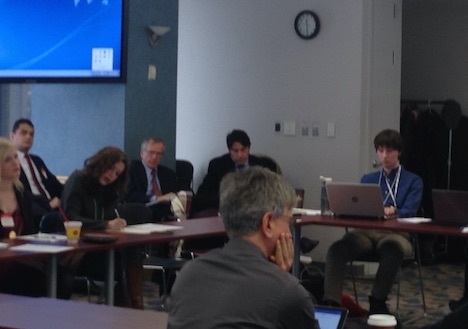 Nathan Ince, Carleton University, I-CUREUS project, (Winter 2014). Francesca Taucer and Victoria Hawkins, Carleton University, I-CUREUS project, (Winter 2015). Both worked in the archives of OXFAM Canada at the main office to make an inventory to facilitate the transfer to Library and Archives Canada. Victoria assisted Archives and Research Collections at Carleton University in the organization of the newly acquired archives of Match International. she wrote a blog for the CNHH on one of her findings, on the Creche for the Children of Hospital Workers in Lusaka, Zambia, 1980-1981. Uriel Contreras, from ITESM Puebla Campus, Mexico, MITACS Globalink project (Summer 2015). 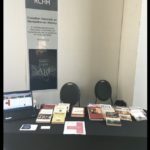 Uriel accompanied the CNHH at the CanadianHistorical Association Annual Meeting, helped set up the website, and organize the Second Workshop of the CNHH. He wrote a blog on his visit to the archives of Plan Canada: My Visit to Plan Canada’s Head Offices in Toronto. See also Introducing Uriel: Summer Student Joins Canadian Network for Humanitarian Aid. Sean Eedy, PhD Carleton University, (From Fall 2015). In addition to being the webmaster, Sean wrote a blog on German Diaspora Aid in the Post-War and its Meaning for Today. Nicholas Hepner , A third year undergraduate RA in the Department of History at Carleton, enrolled in the Practicum in History (HIST 3807), Nicholas is working at Cuso International to identify and research lives of alumni of the 1980s onwards (Winter 2016). Practicum Student Nicholas Hepner in the offices of Cuso International in Ottawa with Aynsley Morris, Director of Communications and Marketing, and Jennifer Buter, Communications Officer. Tyler Owens (2016-17) Carleton University, I-CUREUS project, Keith Spicer archives, Global Affairs Canada Conference, 2016-17. Tyler wrote the account of the CNHH workshop on archives of humanitarian aid: Archives and Foreign Aid, A Workshop SummaryHe helped prepare two illustrated maps of Dr. Spicer’s travels in Asia in 1960, displayed at the Global Affairs Canada Conference on Historical Perspectives on Canadian Foreign Aid, 1950-2016, about which we wrote a blog: Keith Spicer: Illustrated Maps of Humanitarian Travels in Asia, 1960. He also did some research for the CCIC Global Impact Soirée. Tyler Owens (right) taking notes at the Global Affairs Canada Conference, 2016-17. Sonya DeLaat (from 2016) PhD candidate in the Faculty of Information and Media Studies at Western University in London. Sonya is working at a virtual exhibition on refugees and humanitarian photographs (2016-17). 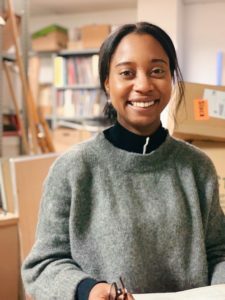 She presented her work on “Iconic humanitarian photographs of the 19850s and their legacies” to the CNHH in a workshop in 2016, and co-wrote a blog on Treasures of CIDA’s 30-Year-Old Photography Collections: A Visual Perspective on Canadian International Aid . Dr. Beth Robertson, (from 2017) Carleton University, Research Associate, from 2017. 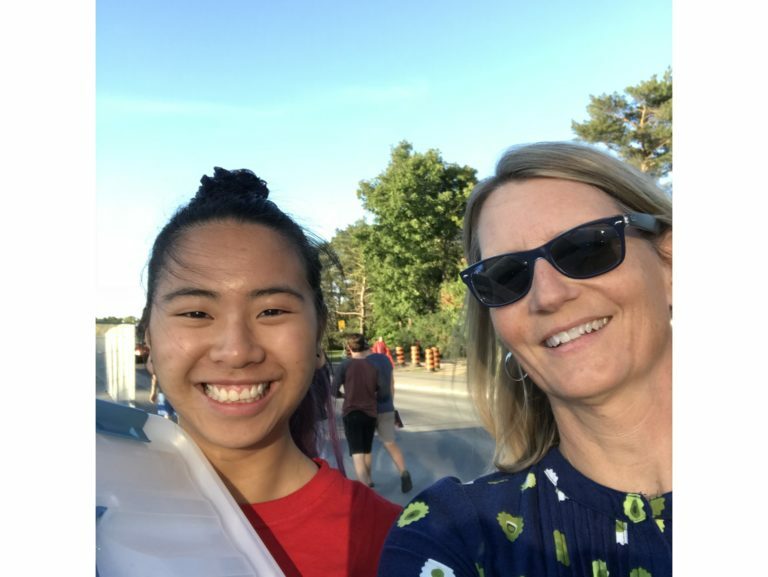 In collaboration with the Carleton University Disability Research Group, Beth is working on a virtual exhibition on assistive technologies and refugees. Financed by the Migration and Diaspora Studies TD Fellowship. She is collecting archival and oral histories from the Canadian National Institute of the Blind, Handicap International and other international NGOs. Beth displaying the “Envisioning Technologies” exhibit at Carleton University Life Science Day with colleague and Social Worker Roy Hanes. 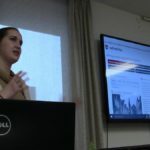 Julia Van Drie, Carleton University Undergraduate Students in Political Science and History, I-CUREUS project RA (2016-17). 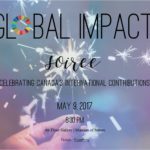 Julia assisted the work with the Latin America Working Group archives and history project, the Global Affairs Canada Conference on the history of foreign aid, about which she wrote a blog ( When Historians Meet Aid Workers and Policy Makers, and did some research for the CCIC Global Impact Soirée of May 2017. Sandrine Murray, (2017) Journalism and History undergraduate student, I-CUREUS RA, Carleton University. 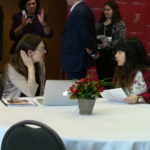 Sandrine prepared and held the display tables at events such as the Philanthrothink colloquium The Future of Charity Regulation in April 2017, the CCIC Global Impact Soirée of May 2017, and the launch of the book on the history of the Canadian Red Cross in April. Lui Xia Lee (2018). A third-year undergraduate I-CUREUS RA in the History and Journalism programs at Carleton, Lui Xia assisted the archival work of CNHH member Sonya Grypma, on Canadian missionary nurses in China. Read her blog here. Anne-Michèle Lajoie (2018-9). 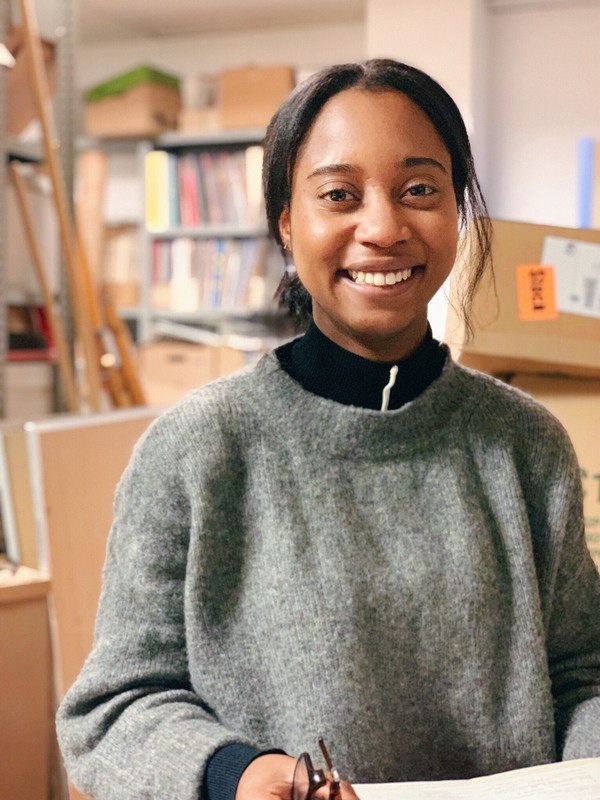 A second year undergraduate RA in the Public Administration program at Carleton, enrolled in the Practicum in History (HIST 3807), Anne-Michèle is working in Montreal at Alternatives to research the history of the humanitarian NGO in preparation of its 25th anniversary in the Fall of 2019. She is supervised by Myriam Cloutier, Communications and Mobilization Project Officer. Anne-Michèle in the Montreal office of Alternatives. Ross Zimmermann (2018-9). 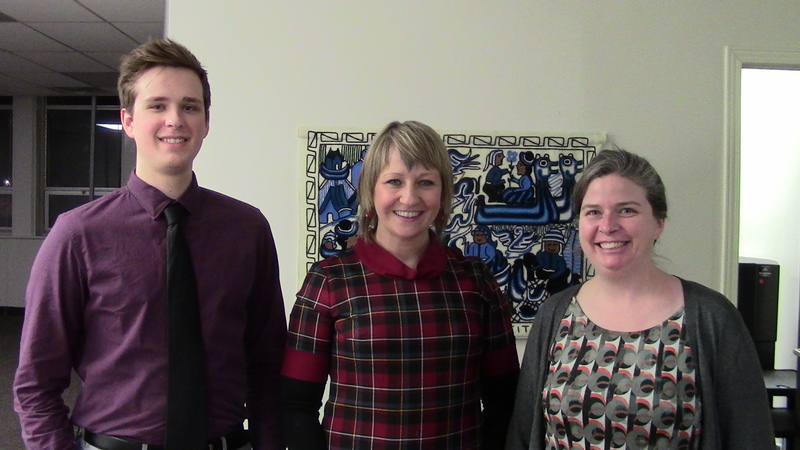 A fourth year undergraduate RA in History at Carleton, enrolled in the Practicum in History (HIST 3807), Ross is working in Regina at the Multicultural Council of Saskatchewan, to help organize and transfer the archives of the organization. He is superbised by Yordanos Tesfamarian, Education Coordinator.